The letter below, posted with the full permission of the writer, is a perfect example of why parrots are not suitable as pets. It illustrates why they simply do not fit within people’s limitations to care for them even in the best circumstances. This letter is also just one of many such letters and phone calls received by our sanctuary, as well as all other avian sanctuaries worldwide on a daily basis. The enormity of the problem is truly difficult to grasp. “Hello, my name is Annie. I am 70 years old and I own (?) a lilac crowned amazon parrot. I just watched your opening video about parrots and your organization. I could have written it myself, and it made me cry, because everything you said and indicated in that video is OH SO TRUE! Parrots are not really ‘pets’. And it is so incredibly wrong to put these intelligent, beautiful creatures in cages. I have had Ringo for 30 years. I got him as a baby parrot (he was born and raised here in the U.S)., but I am facing a heartbreaking dilemma. My husband developed asthma nearly a year ago and his doctor said we should try to find Ringo another home. So, as much as I hated to do this, I began to research the different options available. I had always felt that when I died, it would not be a problem to get him into a NO ADOPTION sanctuary. Needless to say, I was very wrong. 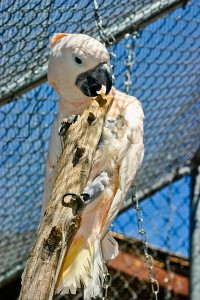 EVERY sanctuary is full and has a long waiting list, not to mention they nearly all adopt out the birds they take in. I had already decided that I did not want that, as I knew Ringo would be so heartbroken to lose me, and I didn’t want him to go through that. I have tried to the best of my ability, to give him a happy, and as close to normal life as I could. He hangs out in the trees in my back yard (in the summer), and is able to fly from tree to tree, and I have tried to be his ‘flock’, along with my husband. But, now, my husband’s asthma is getting worse, and to compound the problem, I have developed health issues, also. To the point of them shortening my life, perhaps. I have stepped up my search since then, but nothing is working out. Just last week, I spoke to a veterinarian in a town close by (I live in a very small town) and he has specialized in finding homes for exotic aniimals (including parrots and other birds), and he told me the only solution that was probably going to be available to me, was to put him to sleep! My husband and I have no children, and we have no friends who would be willing to take him. (Or anyone I would be willing to trust to take him). To put him to sleep is something I never thought I would have to contemplate. Is this truly the only answer for him? If you can help me, I would be so, so very grateful. My husband and I are on a fixed income, and we do not have money to donate to your organization, but perhaps we could try to come up with something. I wish this wasn’t a plea for help, and was a huge donation, instead. I have been through so many dead ends in the last year, that I do not know where to turn. If you have any suggestions for me, or, even better, a solution, I would appreciate hearing from you. Please answer this plea, as I don’t want to keep waiting for an answer that never comes. The Humane Society of the United States (HSUS) has focused for years on the problems resulting from puppy mills, kitten mills, and other small animals sold as pets. Matt Smith, the Director of Project Perry, an extremely professional parrot rescue aviary, has tried for some ten years to get HSUS to understand the plight of parrots sold by parrot mills. Red’s life before joining our flock was far from luxurious. For many years he was used as breeding stock by a parrot breeder in New Hampshire. Parrot breeders are notorious for keeping their breeding birds in less than adequate conditions, depriving them of basic necessities such as medical care, a balanced diet, toys, and even light. Red, for example, was often kept in areas without sufficient heating, or even outside in 45-degree weather. 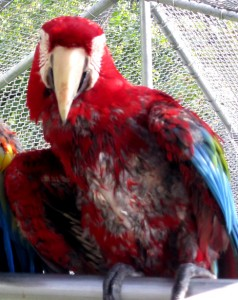 For a tropical bird such as a Green Wing Macaw, these conditions must have felt like pure punishment. Fortunately, these dark chapters in Red’s life were soon to come to a close, as an extremely kind-hearted woman took interest in his plight. As a visitor to this breeder, she happened to witness the breeder’s lack of care or kindness for his breeding birds. She was particularly horrified by how he treated Red. “If you hate him so much, why don’t you just give him to me?” she asked the breeder. “Because he’s worth money,” was his cold reply. The lack of compassion conveyed in his response is the typical attitude most parrot breeders have toward their breeding stock. Breeding parrots are often kept with minimal care so that the parrot breeder can reap a larger profit. Seeing that money was the priority for the parrot breeder, this saint of a woman offered to buy Red from him. And she did not buy him looking to make this gorgeous bird a pet. Once she purchased him from the breeder, she began looking for the healthiest new location for him. Garuda Aviary when we were located in Arizona, looked (we are proud to say) like the perfect place! Because of Red’s previous inadequate care, he was prone to periods of illness from bronchial infections and a persistent fungal infection. To recover, he needed long courses of medicine, including strong antibiotics. Red also needed additional supervision and a restful place to heal, which he received in the home of Garuda Aviary’s own Claire Waggoner. Once we were settled in Maryland, Red was healthy enough to become a permanent member of the flock. As our Aviary flock members usually have access to a large outside aviary, they enjoy the frequent opportunity to mingle with all of their flock mates (under supervision, of course). During such occasions, we noticed Jack (a female Scarlet Macaw) and Red hanging out together more and more. Quickly, they began demonstrating mating behaviors with each other. Several times, we saw Red (who tended to be a little gruff) roll over on his back while Jack tickled his belly. We were stunned because we had never seen Red show that much affection for any human or parrot. Like many animals, (including humans) parrots are often very competitive with other individuals of the same gender. When two macaws bond as mates, they tend to distance themselves from the main flock because they don’t want mating competition from other flock members. Once Jack and Red bonded, they required a cage of their own… a “honeymoon suite,” one might say. Now, these two are a mighty force to be reckoned with. Both Jack and Red are noticeably larger than other members of their own breeds. As life-bonded mates, they would defend each other to the death, if need be. Red’s life before Garuda Aviary was oppressive and difficult. Now his life is full of all the enrichments and companionship that this remarkable bird deserves. Parrots: Pets, or Wild Animals? This is part one of articles about the nature of parrots in their natural habitat. Parrots differ dramatically from other animals we consider to be pets. While a parrot might seem tame, it is not domesticated. A parrot’s natural instincts are intact despite learned behavior. Any parrot encountered in a domestic setting is identical to its counterpart in the wild. True domestication requires a change of environmental conditions on a breed of animal over many, many generations. Successful domestication often takes centuries. Humans had domesticated dogs and cats long before the time of Christ. However, keeping parrots as pets has been of mainstream interest for only 150 years at most. Before 1900, the only people found keeping a parrot would have been a wealthy wild game hunter or an exotic merchant of some sort. The way humans keep parrots as pets, is contrary to the natural evolution of the species. 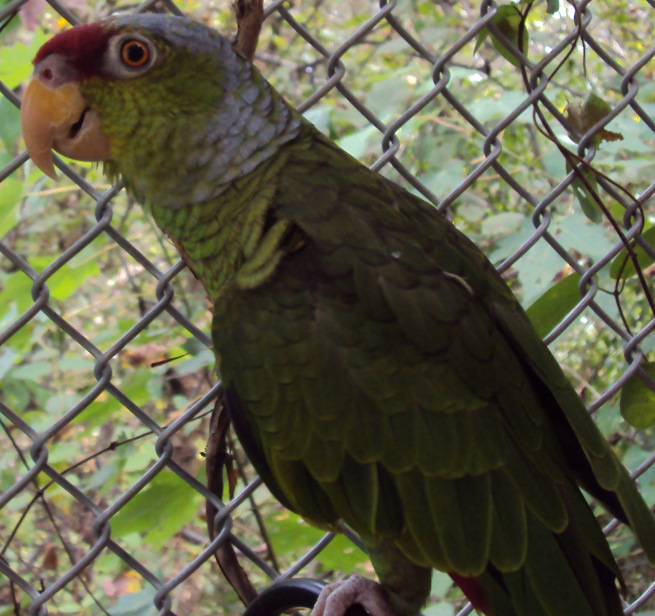 Parrots in the wild are prey animals and are terribly ill-equipped to handle stress alone. A flock is the very definition of safety and identity for many varieties of birds. To subject such an animal to life as a single pet strips it bare of all of its coping mechanisms. We as humans don’t buy a flock of parrots to take home – we usually own one at a time. The flock also represents a bird’s entire sense of identity. You could name a bird George. But the bird does not identify itself as George; it is a part of a greater whole, a flock. It doesn’t see itself as an individual, but rather defines itself by its affiliations to a larger group or flock. So when we buy a single parrot, take it home, put it in the isolation of a small cage, and stare at it with our two predator eyes, the parrot can experience unmanageable anxiety. The outcome is often a “pet” that bites, screams, is aggressive, or destroys its own plumage. Some parrots can become so emotionally unbalanced as to lethally self-mutilate. A very common behavioral problem of parrots in a domestic setting is feather plucking. This disorder is not found AT ALL when parrots are in their natural setting, free to fly and with their flock. Just like humans turn to obsessive-compulsive coping mechanisms for unmanageable stress, so does the parrot. Feather plucking is undeniable evidence that how we make them live falls far short of what they need to live a healthy and well adapted life. We in the Garuda Aviary strongly believe that parrots should remain in the wild, and not be subjected to the very real trauma of a life lived in captivity.